Portland. I've heard many times that Portland is like a spread out Brooklyn, a wanderers play land filled with trees, air and artists, that I'd love it, need it, have to have it, so I went... It was planned, Summer 2012 Portland but I did little research on what to do, where to go and what to expect. I knew one thing, they could eat. I scoured the interwebs for what to fill my belly with, and came up with quite the list, filling all 7 days with spots to hit for breakfast, snacks, desserts, lunch, dinner and cocktails. St. Jacks Patisserie- 2039 SE Clinton / Greeted by a counter displaying beautiful French sweets under grand bell-shaped glass lids, and the scent of sweet in the air, this quaint space was a perfect spot for a late afternoon sweet tooth. Although I had heard I must have the eclair and the madeline, I walked in at not the greatest time, when the patisserie was beginning to close, but don't fear dear readers, there was still a wonderful selection to choose from. We indulged in Frangipane and Canelé (pictured above). The Frangipane was a perfect little almond treat. The Canelé had a delicious soft custard center and a thick caramelized crust. Perfect. Make sure to go before closing time (4pm) and try the madelines, baked fresh to order, and tell me all about them! Le Pigon- 738 East Burnside Street / Chef Gabriel Rucker has been bestowed a Food & Wine "Best New Chefs" recognition in 2007, and the James Beard "Rising Star Chef of the Year Award" this past May and he sure did deserve it. 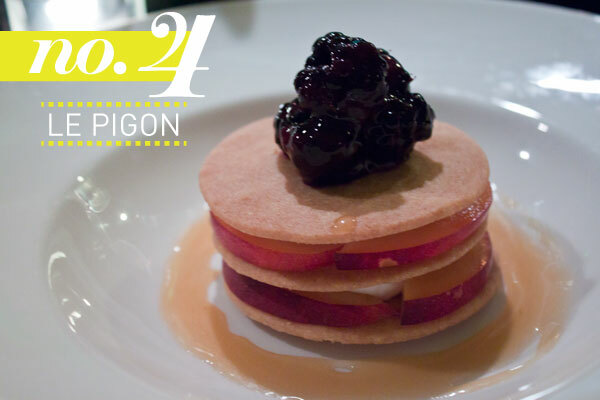 Le Pigon is a small space with a homey vibe. We did not have a reservation, but were accommodated at the bar portion, which allowed us to sit right in the action, with the Chef and Sous-Chef basically cooking in the dining room, right on the other side of the bar! The foodie in me loves to watch people (especially professionals) prepare food, so I was mesmerized. I was able to speak directly to the dessert Chef and get his recommendation- Peach Napoleon. The menu says honey cream, cornmeal, and blackberries, but it tasted like it was cut right out of the Heavens. The mix of flavors and textures placed this at number 4. Ruby Jewel Downtown- 3713 North Mississippi Avenue / Ice cream, who doesn't love it? Its creamy, sweet, cold (it was 95 degrees while I was in Portland!) and just delectable. Lisa Herlinger of Ruby Jewel gets ice cream right, filling the gaping hole she saw in Portland in the artisan ice cream section. It is made with Northwest ingredients including Oregon-grown berries, lavender, mint, honey, and vanilla. I decided to go with something more standard as my flavor choice, strawberry, but I sandwiched it between the homemade chocolate chip cookies. If being the perfect ice cream sandwich isn't enough, the reclaimed wood walls, rustic details and candy room alone should send you in to get your scoops. The Pie Spot- 521 NE 24th Portland / This gem was not something I specifically went looking for, but was overjoyed to find. Somewhere between pasty at St. jacks and dinner at Pok Pok, we found a small food truck "park" called D Street Noshery, with everything from Indian cuisine, to craft beer, to single serving PIES. I have to admit, I have a love for tiny desserts; cupcakes as opposed to cakes, munchkins instead of doughnuts.... so TINY PIES= irresistible. Grab a mouth watering pie (banana cream pictured above), and a cold beer from Captured by Porches and take a seat at the picnic table area. The crust was crumbly and buttery, the filling sweet and fruity and the topping finished it just right. They also have savories, which you should go try and tell me about. ok, now lets talk about it. The warm cake absorbed the ice cream and bourbon caramel sauce. It melted in my mouth, danced on my tongue and warmed up my soul. Go there, get the oysters, but save room for dessert because it is my A#1FAV.